SyRUSH is out now for iOS! 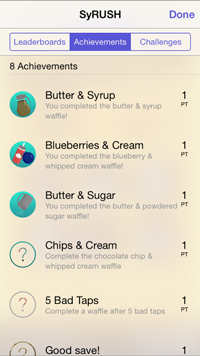 The latest game from us here at Two Scoop Games is SyRUSH, which we have deemed “the official waffle simulator of breakfast,” is out now and available in the iOS App Store. Feel the rush in this fast-paced arcade style game where you tap waffle squares to fill your waffle with the perfect distribution of mouth-watering toppings. Full version of the game includes 7 unique toppings. 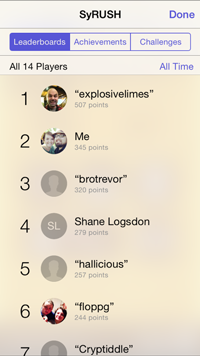 This is our first leap into Apple’s GameCenter, which means SyRUSH has online leaderbords to compete with waffle afficianados across the globe, and fun achievements to unlock. The game is free to try, and 99 cents to purchase the full game(via in-app-purchase). This entry was posted in Game Release and tagged Game dev, Game Development, iOS Games, iPad Games, iPhone Games, release, SyRUSH, Two Scoop Games on September 22, 2014 by abezuska.